An outpouring of grief and love, the likes of which hasn’t been seen in England since the tragic death of Princess Diana continues an hour north of London in the town George Michael called home. Fans and devotees of the 80s and 90s pop icon from as far away as Australia, New Zealand and the United States flew to the United Kingdom with the sole purpose of leaving a wreath, or a note to the deceased singer. A tribute to the singer outside his home. 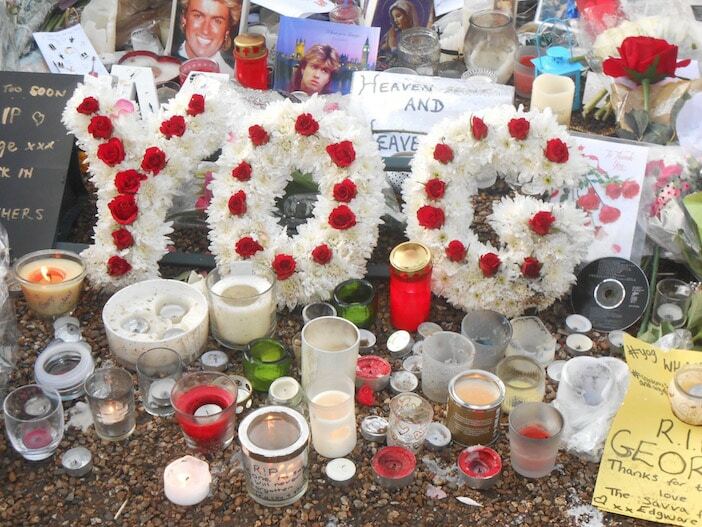 Michael’s family and close friends called him “Yog,” which is a nickname derived from his Greek name. 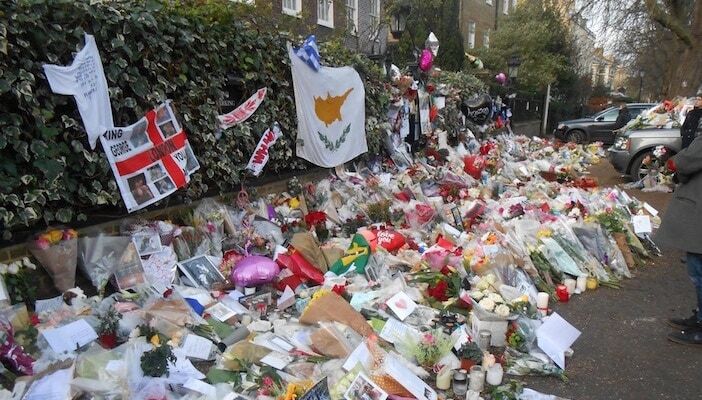 Many Greek Cypriots placed their national flag amongst thousands of bouquets of flowers, candles, letters, photographs and other memorial items— a reference to his ancestry, something that was always at the forefront of the pop singer’s psyche while growing up— and while selling out arenas and selling over a hundred million records. 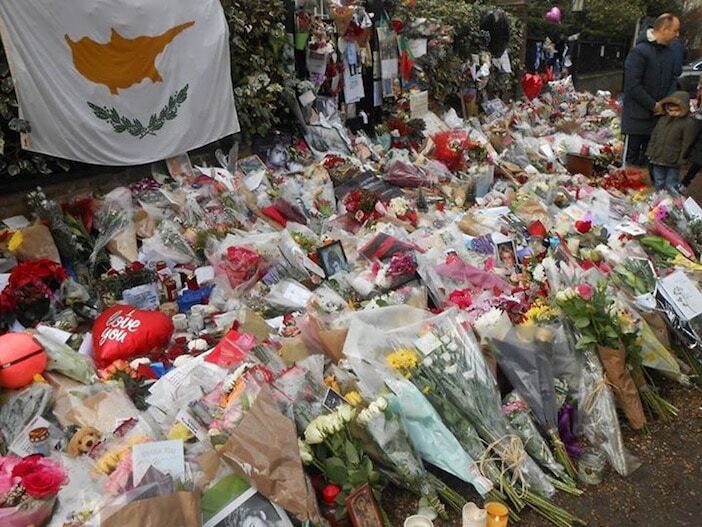 The flag of Cyprus is on prominent display at the make-shift memorial outside Michael’s home. Michael was born Giorgos Kyriakos Panayiotou to a Greek Cypriot immigrant father named Kyriacos Panayiotou who changed his name to Jack Panos when he emigrated to London in the 1950s. His mother was a British woman named Lesley Angold who found out later in her life that her own mother was Jewish, but was disowned for marrying a gentile and emigrated to London. 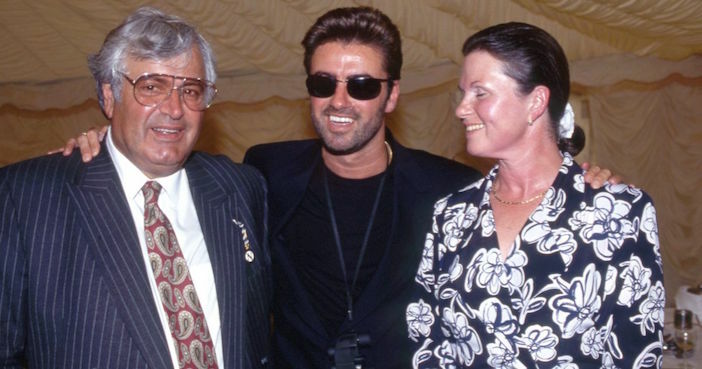 George Michael with his parents Jack and Lesley. 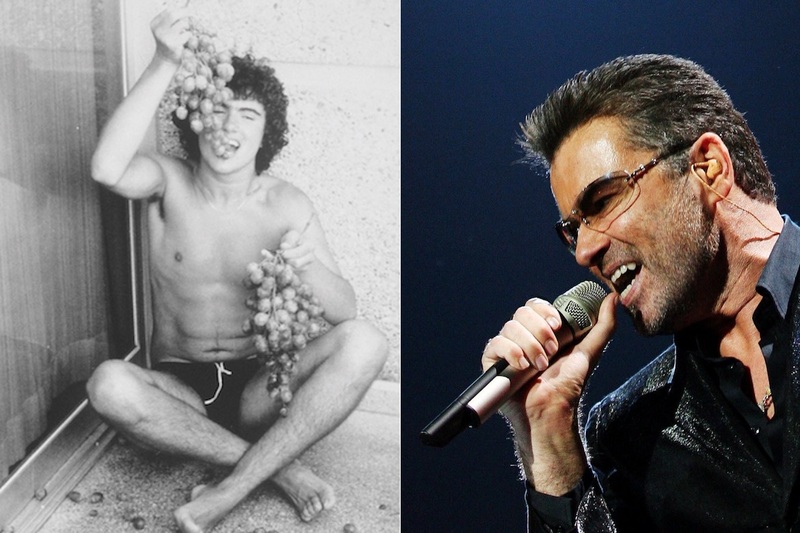 Dad believed that his son’s dream of being a singer-songwriter was a preposterous delusion— indulgence of a British-born boy who hadn’t tasted the hard Greek work ethic like so many immigrants had. And that hammering away at his son ended up staying with him for years. His presence as an overbearing Greek father had an affirming impact on the singer’s career, as he noted in an interview with The Independent. His father famously told his son that he wasn’t talented and couldn’t carry a tune— even as he was bringing home hit after hit, duets with Aretha Franklin, and selling out arenas throughout the world. “People with a childhood like that turn it to their advantage,” Michael said in the same interview. Despite this tough, rigid upbringing, Michael was always able to go beyond his father’s push-back to his dreams and spoke glowingly about his upbringing and specifically, his father. 1979: Giorgos Kyriakos Panayiotou at 16 during a summer vacation in Cyprus. “I have always admired the heroic hard work my dad put in, to raise us up from living seven in a room— which he was back in Cyprus— to having a good standard of living.”. Even when Michael became one of the most famous people in the world, it was never enough: Jack Panos was always there in his mind, saying it was all rubbish, rubbish, rubbish. Michael spoke often about the Greek impact on his upbringing. He told the BBC in a radio interview that he had tremendous guilt because of his Greek upbringing. He jokingly told the BBC interviewer why he changed his name. “When you’re born Giorgos Kyriakos Panayiotou, there is a very urgent need for a stage name when you’re 18 and want to be a British pop singer,” he said. But the name change didn’t mean he turned his back on where he came from. The singer maintained a close relationship with his family and community. He was extra-generous to Greek Cypriots in the United Kingdom who live with a blood disorder known as Thalassemia. Plans have not yet been shared about the singer’s funeral as his family still deals with the autopsy to determine the cause of death. Various reports have surfaced that Elton John and Mariah Carey will sing at a memorial service and it is believed that the family, which is handling the arrangements, will oversee a Greek Orthodox funeral. Although Michael did attend the Protestant church in his village where he loved, about an hour and a half north of London, he told residents there that he was Greek Orthodox. Thousands of people have visited, leaving flowers and memorials to Michael, who was one of the biggest pop singers in history. So the Greek Orthodox Church will accept this gay man now that he has passed away? That, in and of itself should be a miracle. Has the Orthodox Church refused to conduct a funeral for a gay person? LOL… if the Orthodox Church stopped burying gay people they wouldn’t bury a whole slew of their own priests and bishops. Very ccnfusing, indeed. Our priest probably would not. Sometimes money speaks, sadly. But, who am I to judge? Very confusing, indeed. Our priest probably would not. Sometimes money speaks, sadly. But, who am I to judge? I will add, only God knows the heart. George gave generously and anonymously to many. He was a flawed human belng. Aren’t we all? I’m sick and tired of these anglo-Greeks making stuff up about the imagined horrid conditions of their native countries. They greeks of Greece have better lives than we do and the premature horrible death of this man is proof. The anglo-Greeks need to make themselves feel better for being slaves to their mortgages and taxes and bad health. Everyone has a story to tell. Why do we have to place every celebrity that passes away under the microscope. GM lived, he created art and most of us enjoyed it. Let the guy rest in piece. End off. Agreed from Australia. We have busted our backs to ensure that we own at least two homes, send our kids to private schools and ensure we have enough money to retire. Greeks in Greece live like playboys, look like a million backs and to hell with the future they say. Greek Orthodox Religion will allow a funeral for a gay man but can refuse if it was a suicide. Right on, absolutely! He is loved. What a great way to remember this man I feel the same. RIP Yog! Our world will feel your presence every time one of your songs is played. You fought your demons as long as you could. There is a lot of love felt for you. Rest easy now , you will be missed. Love you George. Penny from the USA. What there going to bury is his body only the real George Michael is in heaven with Jesus Christ and his mom Lesley when a person dies his spirit immediately leaves the body and either goes to heaven or hell Jesus Christ says I’m the way the truth and the life nobody comes to the father except trough me Jesus Christ is the only way to God the father. God Bless you George Michael, and may you be in heaven singing to my beloved daughter Gina who died three y ears in London due the lack of care by the North Middesex hospital leaving behind her beloved son for which they have accepted liabiliy. I am Cypriot brught up in London now living in Cyprus. I love this country but bringing my daughter over at te age of 13 may have caused her not to realy settle here thought she did have some awful luck, having had a short marriage, losing her best friend and uncle in the same year[1992 and re turning to London where she had a relationship from which she had a b eautiful whom she adored. I was in London for her mnimosino in October [3 years] and will come over each year for that. The pain is unbearable, buy for the sake of my sons and grandson and granddaughter I carry on as best as I can. Please accept my condolences. He was a wonderful person and his music and good deeds will live forever. You will be a hard Man to get over and your music will be heard everyday for ever..